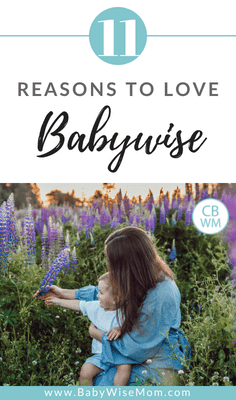 Eleven Reasons to Love Babywise. 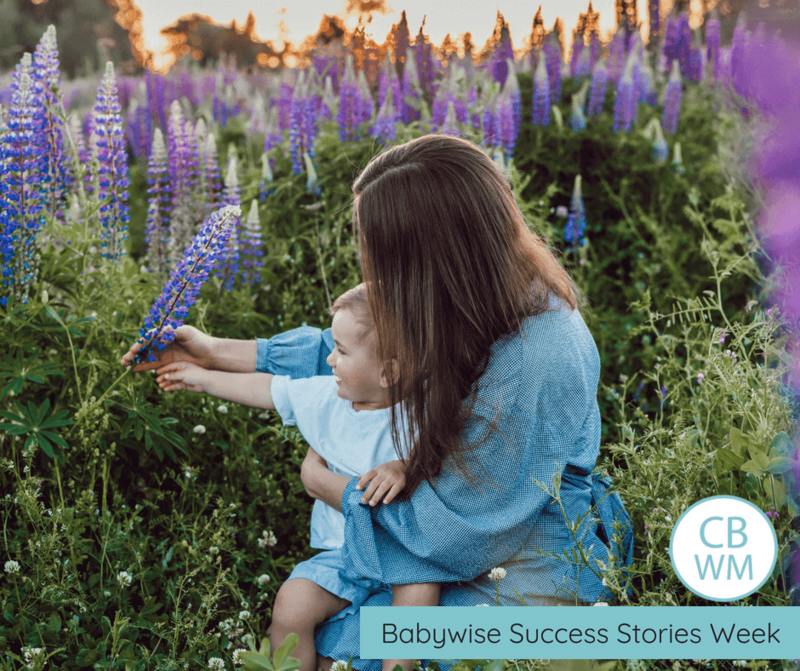 Why 11 moms love Babywise and how they have found success by using it. I have loved reading the different successes from people this week! This is our grand finale. These eleven moms are sharing their own success with Babywise. Thanks for a great week! Mostly I feel akin to other babywise ladies! I can’t go with the flow like the attachment parents and scheduling has really brought my level of chaos down CONSIDERABLY! My lil dude also sleeps so much better because I have direction when and about how to do things! (First time mom here!!) I wouldn’t say I’ve read the babywise books but I’ve got the gist on a lot of the ideas and Valerie’s blog plus my best friend and the ladies in the facebook group. 3 BW babies. Ages now are 3.5, 2.5, & 5 months. Crazy?! Not with BW! Baby sleeps 7-7 and 2 toddlers sleep 730-8 & one still takes a 2 hour nap. Rested parents=good parents! I stumbled upon a shared Babywise post when my son was a week old (he’s 19 months now) and I was at my wits end. I had never really been around babies, so I wasn’t sure of the finite details and I just felt like I was STRUGGLING (plus, postpartum was unkind to me and babies didn’t come with manuals? Whose idea was that!). I started simple, reading only what applied at the moment because I already felt overwhelmed and that I didn’t have enough time in the day to manage myself, let alone this new routine. It was easy to understand, with a nurturing yet factual basis. In general babies sleep X amount of time, are awake X amount of time. It’s common to have over stimulation at first, etc. It just felt so basic. By 8 weeks old my son slept 10 hours consistently. By 5.5 months he was up to 12 hours a night and has never stopped (there were leaps, growth spurts, sickness that have interrupted some sleep, but I’ve never had a regression). I love knowing what to expect. It’s easier for us as a family and my son because he knows what to expect in his day. Children are known to thrive off routine, so I don’t know why you wouldn’t utilize that! Every stage and age is a season, so the flack I receive for being diligent on being home for bed time, I just let that roll. I also get criticism for letting my baby cry-it-out. I wouldn’t necessarily be opposed to that, but I’ve never had to. By reading my baby’s signals and putting him down drowsy and in a general time frame that he should need to go down, has always worked! Every child, every family is different. With basic guidelines like wake times and routine, you can make the rest fit and work for you and your baby/family. We will always be a BW family as far as I’m concerned! My son is not a “naturally good sleeper”. He’s always been fairly low sleep needs and before I started babywise he would not nap unless held. After starting, and with the help of this blog and group, it has been night and day. On day 1 we got him successfully napping in his crib. At 3 months he was sleeping through the night and has ever since. He now naps like a champ and everyone remarks on what a good sleeper he is and what a happy pleasant baby he is and I tell them it’s because of babywise! I literally cannot imagine babyhood without Babywise! BW meant I went into new parenthood (and three times around) with a plan, a strategy and confidence. Of course, babies don’t always go to plan and that is fine, but I knew the routine I was working towards and when a day went off track, I just worked to get us back on the next day. Thanks to the BW routine, my babies all slept through the night quickly (starting between 4 and 10 weeks) and napped well and consistently. It help me read their cues, keep life going even when a new baby joined the family and made the newborn season my absolute fave! I am beyond thankful for the confident start that BW gave me and would recommend it to any new parent. Our 4-year-old daughter has been a babywise girl since week 2. I cannot imagine life without the structure, principals, and general guidance of babywise (toddlerwise, etc). The proof is in the pudding — my 4-year-old sleeps 12 hours a night, takes a 2-hr rest/nap each afternoon, eats a wide variety of foods, accepts discipline like a champ, and is a very happy child. People always compliment how well-behaved and happy she is. The babywise principals have helped us feel more in control of this parenting gig. Our daughter knows that we parent with purpose and she knows what to expect from us, something that allows her to be a kid. I absolutely love the fact that I can anticipate my baby’s needs. BabyWise has made me a lot more confident as a Mom. My husband is also a huge BW fan because it allows him to keep the kiddos so I can have a day/night out and he knows what to expect & when. I have three very different kids–6, 4 and 1, and they’ve all been BW babies from birth! I love the routine and predictability we have. We’ve had bumps along the way, but working on a schedule has been so helpful! My kids all slept through the night before 4 months and remain great sleepers. Babywise gave me so much confidence as a new mom, with no experience with babies. Even though the first couple months were rough due to food sensitivities, my son slept 8 hours by 9 weeks. Once we figured out that we couldn’t nurse, things were much better and the things that we had been struggling with started to resolve themselves. Due to the pain he experienced in the beginning we didn’t feel comfortable with CIO but we still followed the basics of Babywise. Now, at nearly 9 months, my son goes down by 7:30 and sleeps till 7. I love being able to spend some time with my husband in the evenings and know that I will have a certain amount of time to get chores done during the day. I was in the grocery store today and had a woman compliment me on my happy baby. She said the last time she was in there, a baby cried the whole time she was shopping. I love knowing the general amount of time I have to run errands before I have a sleepy baby! I will definitely be implementing Babywise with any future babies! P.B.With the perspective of 14 years child rearing, I can now say that Babywise principles have made a significant difference for our children. I have 2 kids on the autism spectrum and as I started meeting with professionals and other autism mums, it became clear that poor sleep and picky eating are very common with kids on the spectrum and can be significant challenges for families through teenage years into adulthood. I am very thankful that my kids have great sleep routines and enjoy a wide variety of nutritious foods, setting them up for health and success in all areas of life. Neither of our families did Babywise, but they’re both very supportive. They are just amazed at how great our LO is at going down for naps and bedtime, and how she has been STTN since 10 weeks! Especially when they babysit her, and she still goes to bed like a champ, without mom or dad. Every time family or friends visit, they are shocked at what a great sleeper she is and that she knows how to go to bed, and that she is so happy, healthy and thriving! Our favorite is when a stranger finds out we have a baby and they ask, “Are you missing all your sleep?” We always look at each other and smile, “Nope! Sleeping great!” 😆 She’s 6 1/2 months now!